Recliner Risers™ raise the chair’s height 2"-4", decreasing strain on back, hips and knees, but won’t interfere with the chair’s rocking or reclining motions. Furniture risers install easily with your tools. 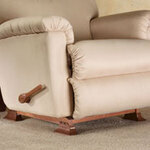 Set of 4 slip-resistant, nonmarking furniture risers for recliners. 350-lb. capacity.